the matter is, our system is a voluntary system." For those over 70 ½—and if you're not, consider this for your parents! Direct donations from IRAs to charity in lieu of Required Minimum Distributions (RMDs) have been allowed on and off since 2006. We didn't know this would be an allowable strategy until late 2006, which made planning difficult. It was allowed in 2007, but few understood the ramifications and even fewer cared, since everyone thought it was a one-shot deal some Congress-critter made for himself or some large donor. It wasn't allowed in 2008 and, while it came back to life in 2009, due to the one-year suspension of RMDs it was helpful for very few. It was allowed for 2010, but no one knew it until December 17, when Congress finally acted and made it retroactive. However, it's back for 2011-hence the impetus for this discussion. Those over 70 ½ are required to take RMDs from IRAs and, usually, other retirement plans. Direct donations to charity can be made, however, only from IRAs. The value of a deduction depends on type and taxpayer. Let's say you don't itemize deductions. However, because you are concerned over political trends, which will subject your grandchildren to increasing intrusions by government that will lower their standards of living, you want to donate (or would donate if only there was a tax benefit) $1,000 each to the libertarian (free-market) think-tanks Institute for Justice, Reason Foundation, Cato Institute and Pacific Research Institute. You give another $1,000 to your church or synagogue, for a total of $5,000. A $5,000 itemized deduction saves zero for those not itemizing, but saves as much as $1,250 for a taxpayer in the 25% marginal tax bracket who itemizes. This is far less than is possible by making a donation directly from your IRA, which can save as much as $2,312. How? Isn't a deduction a deduction? Aren't all deductions the same? Remember, the same people who think they know best how to run every other aspect of your life have so convoluted the tax code that different types of deductions can mean very different tax savings for different people. In this case, the differences and consequential confusion are largely a result of two tax issues: itemizing (or not) and the way Social Security is taxed. Let's say you're single, your RMD is $5,000, your Social Security income is $15,000 and you have $25,000 in other ordinary income (such as interest, wages, pensions or rents). If you withdraw your RMD and then donate the entire amount to charity but don't itemize, your federal tax will be $5,175. If you already itemize before the charitable donation, which means the entire donation counts towards a tax savings (rare though this may be for retirees), your tax drops to $4,228. If instead you make the donation directly from your IRA, your tax plummets to $3,590. Making direct donations from an IRA should, then, be a no-brainer. The only negative is the IRA trustee may charge a fee based on the number of checks they must write-so be sure to ask them about costs. [For geeks: for every $5,000 in additional or reduced income there's as much as an 85%, or $4,250, swing in the amount of Social Security subject to tax. To the extent someone is subject to the 15% nominal bracket, the real bracket for additional or reduced income is as high as (15% + [15% x .85] =) 27.75% and to the extent he or she is subject to the 25% nominal bracket, the real tax rate is as high as (25% + [25% x .85] =) 46.25% (and this doesn't count other phase-outs that result in even higher effective brackets such as the phase-out of medical deductions and investment expenses). Therefore, a reduction in income of just $5,000 (via whatever method is available-including direct donations to charity) can result in a tax reduction of as much as ($5,000 x .4625 =) $2,312. You can withdraw the $977 from any one or more of your five IRAs, the $3,906 from either or both of your 401-k's and $9,766 from any one or more of your 25 403-b's. However, you can make a direct donation in lieu of RMD only from the IRA and must still take the RMDs from the other plans. Why would you want to shift money from one type of plan to another? If you shift enough of your 401-k's and 403-b's to your IRAs to increase the RMD from your IRAs to at least $5,000, you reduce RMDs from the other plans by the same amount. By making direct donations totaling $5,000 in lieu of the RMD from your IRAs, you bring the tax in the example we've been using down to $3,590. Is it worth shifting some assets around for a savings of almost $1,600 (or more in some cases)? Keep in mind, if Congress makes this a permanent fixture of the tax code, this could be an "every year" savings. This could tally up to a lot of tax savings in retirement, while you are helping your favorite charities. This doesn't save tax only for relatively lower- to middle-income retirees (where the Social Security phase-out occurs). It could save substantial sums for upper-income retirees due not only to the fact that many higher-income retirees don't itemize, but also to the effect on Medicare premiums, which (hidden tax that it is) increase as income increases. I think it supremely arrogant of anyone who thinks they know better how to run your life and the derivatives of your life (i.e., your money, tangible property, intellectual property and your person) than you do and forces you to follow their script; and, if on occasion they happen to be right, it is breathtakingly arrogant to take from you the right and privilege of making your own mistakes, which offer the opportunity to learn by experiencing the ensuing logical consequences. Although there are many ways to describe the core libertarian belief, this works. Most of the yin and yang points in Part 1 of this series, which included a libertarian's basic philosophy and views on rights and boundaries, are derivatives of this description. Part 2 described libertarian views on tax and financial matters (again, all consistent with this succinct description) and the things government does that might be better off in the hands of private enterprise, which shuns coercion and instead operates under the principle of voluntary (civil) interaction. Part 3 discusses ideas on where those with disparate political philosophies might compromise, in order to move civilly toward free markets and a freer society. Indebting others for one's own profligacy so that one may party-on is immoral. A national debt, which indebts one's children, grandchildren and great-grandchildren, is therefore immoral. We can begin with this premise when discussing "compromising" freedom and continuing to increase government debt. If consumers and private businesses must tighten their belts, so should governments. If, because of a government induced credit bubble and bust, private employers let go, say, 7.4% of the work force, public employers should have to do roughly the same (they're at less than 1% so far). If private employees take a 5% aggregate cut in wages, since there is no rational measure (i.e., free market) by which to determine what wages should be for public employees, they should do the same. In the long run, public employee jobs should be competitively bid for and government employee unions eliminated. In private markets, quality improves and prices fall whenever consumers are allowed to choose and where they must pay the cost. For example, medical markets allowing the least amount of choice and the greatest amount of third-party payers are those where consumers complain the most, and in which prices are inexorably rising. Open up interstate markets in medical insurance to increase competition. Encourage high-deductible policies to increase the amount of skin in the game. Allow nurses and nurse practitioners to be more proactive in patient management and prescriptions if a patient so chooses. These and other policy changes would result in dramatic decreases in the cost of medical care and health insurance. Welfare has a lifetime cap of five years in most states. Why should refundable tax credits (Earned Income Credit and refundable Child Tax Credit, for example) be any different? With effective direct tax rates that can exceed 50% when such credits are included, along with another roughly 50% or so in non-tax low-income benefits, society must focus more on incentives for those down on their luck to improve the odds they will have better luck in the future. If credits are to be offered to low income individuals for the purchase of high-deductible insurance and health savings accounts, such subsidies should be, like welfare, limited to five years per lifetime moving forward. This will serve to reduce dependence when, due to effective 100% tax rates on the poor, the perverse incentive is to remain poor. Incentivizing productivity improves overall wealth in society. It also encourages a person to become all he can become. Limit the total of federal, state and local production-based taxes (i.e., income and social "insurance" taxes such as Social Security and Medicare) to no more than 50% of any marginal increase in income at any income level, including the effect of phase-outs of deductions and credits. Government systems are inherently inflexible and allow little in the way of experimentation. In every area of private economic activity, producers are allowed to innovate and consumers are allowed the dignity and freedom to choose from among such innovations. Medical insurers should be free to innovate new types of policies. Some will reward lower weight and attendance at AA meetings with lower premiums. Let them experiment in these ways and in any others they choose, so long as consumers can choose from among many. Where are we, as consumers, happy and relatively free of strife? We happily purchase computers, furniture, cars and countless other items from private providers, usually strife-free: you buy your computer, I purchase mine. Yet we are unhappy and involve ourselves in argument after argument in areas largely or completely government-controlled, such as schools. Create competition in schools by ending lifetime job security for teachers and allowing students to use a voucher or refundable tax credit at the school of their choice, a system at least three other countries (including Sweden) have recently adopted. Social Security cannot survive in its current form and pay the promises it has made without bankrupting the nation (it has long been actuarially unsound and is, by operation, a Ponzi scheme). Allow younger people the opportunity to opt out with at least some of their funds by expanding IRAs, as at least 17 other countries (including Sweden and, famously and most aggressively, Chile) have done. Medicare cannot survive in its current form and come close to keeping the promises it has made without political rationing and driving an enormous number of competent medical care providers out of business (it has long been actuarially unsound and is also, by operation, a Ponzi scheme). To incentivize consumers and reduce costs, allow Medicare recipients a voucher or refundable tax credit that allows them to purchase the insurance of their choice (a workable template might be the choices the federal government offers its own employees). If we're to continue taxing incomes (which reduces incentives to produce), tax once and not twice or even three and four times. Eliminate the 85% phase-in of Social Security benefits to taxable income (the employee's share was already taxed), the tax on corporations (the ultimate beneficiary of the income pays tax on dividends) and the estate tax (these are assets accumulated throughout a lifetime on which tax has already generally been paid, often multiple times). People change their behaviors with varying incentives. As a result, a 10% tax increase will not increase tax collections by 10%. Require all tax projections from prospective tax law changes to recognize this by using non-static analysis. Let a body independent of Congress make these determinations. Do not let them play the same games as the Congressional Budget Office recently did in grossly understating costs resulting from the implementation of Obama Anticare. Voters are supposed to elect their representatives, yet our system allows representatives to select their voters, resulting in a re-election rate exceeding that of the former Soviet Politburo. The cost of regulations often exceeds their benefits by orders of magnitude. Accounting incorrectly for pension costs by private industry is illegal. Congress often exempts itself from the laws they impose on the rest of us. All laws that apply to us should apply to government and government employees. Bad monopolies are generally created by government and do not survive where free markets reign (competition will result in the bad company's demise). Allowing workers to prevent non-union members from working allows bad employees to work at above-market wages. Put all government projects out for competitive bidding with no exclusions for non-union firms. Adults should be treated like adults, not children. Laws should never consist of 2,000 pages, which lawmakers obviously never read, yet which all Americans are required to follow. Require that all bills be read aloud in front of a fully assembled Congress (no absences allowed) before voting on them. This should put an end to anything longer than two or three page laws (with thanks to Libertarian Presidential candidate Wayne Allyn Root in his 20-point Reagan Libertarian Contract with America). In our system, some pigs seem to be more equal than others. If a private person could be charged with fraud for committing an act, a government employee should be charged as well. This includes actuarial fraud in accounting for future projected pension costs and, of course, tax fraud. Do you agree that taxes should be increased by ½ of 1% in order to pay for the continuing expenses of government? Do you agree that taxes should be increased by ½ of 1% in a state in which taxes are already higher than all but two other states in the country? Do you think that property taxes should be increased in order to pay for the continuing expenses of government? Do you think that property taxes should be increased in a state in which taxes are not only already higher than all but two other states in the country, but in which spending has increased in the last decade at a far greater rate (48% in the decade ending 12/31/08) than population and inflation increases? Do you think that property taxes should be increased in order to pay for police protection and prisons? Do you think that property taxes should be increased in a state that spends 2 ½ times the amount many other states pay per prisoner for incarceration? Should they be increased when many law enforcers can retire at age 50 with a lifetime pension equal to 90% of their last yearly pay (which may be comparable to you having several million dollars in your IRA with which to purchase an inflation-adjusted lifetime annuity for the same amount)? Should they be increased when property tax revenues have skyrocketed by 800%--from $5.6 billion per year in 1978 when Proposition 13 passed, to $50 billion currently (extraordinary, considering that income tax collections have increased by only 500% or so in the same time-frame)? The next time some politician asks you to increase your own tax and your friends, family and associates say, "sure," show them this chart. Bear in mind, this is an average of all states; the spread is generally far greater in CA, NY, IL and other Democrat-controlled states than in Republican-controlled ones (please remember, I'm a life-long libertarian). To be fair, however, we need to adjust for both inflation and population growth. Let's be fair. 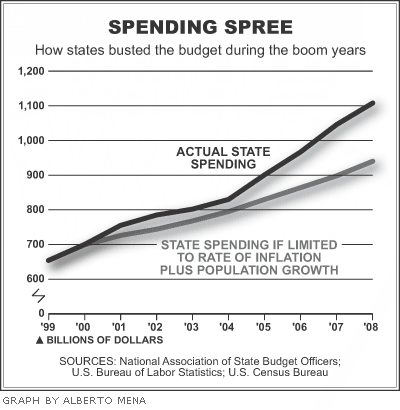 Now we can see just what spendthrifts-with other people's money no less-California state politicians have been since from fiscal year 1997-1998 to 2007-2008. I would suggest that the current Depressionary conditions, caused in large part both by state legislators and by voters who decided we'd be the only place on the planet with a system of carbon caps*, are only beginning to force state and local governments to get real. However, because of gold-plated government pensions and tremendous waste in the system, they've barely started. * With apologies to my clients who still believe in what I've thought from the beginning is the greatest hoax in scientific history, anthropogenic global warming, this alone could keep us in a depression for many years. I won't bore you with the extraordinary goings-on I've had with the IRS over the years, but there are several recent issues and cases of which you should be aware. First, recharacterizations of Roth conversions are attracting unnecessary scrutiny. Say you convert $20,000, then "change your mind" on $5,000 and recharacterize that amount. You're taxed on $15,000, but because the IRS is either not getting the notices of the reversal from IRA trustees (for which those trustees can be charged large penalties, so I question that idea) or the IRS is not getting the recharacterization into their system, you get a nastygram. In every case, I've proven to the IRS the recharacterization was correctly made, but only after getting proof from our client. As a result, unless I see the IRS correcting its way, I may begin asking for proof and a Power of Attorney when filing returns for clients who recharacterize Roth conversions so I'm ready to respond when the letter comes. And, while I never before suggested that clients keep copies of any Forms 5498 they receive (showing the amount converted and the amount recharacterized), I now strongly suggest that you watch for these forms (which are sent any time between May and November of each year) and send me copies. Second, IRS computers were incorrectly programmed on at least two issues last year. IRAs for those making a special election to pay Social Security on gross self-employment income were not allowed until I got involved. (The strategy, which can save several hundred dollars, is unusual but completely legal and can make sense on a number of levels. It may, for example, allow IRAs to be funded, increase the Earned Income Tax Credit, allow a deduction for self-employed health insurance premiums, and potentially increase future Social Security income, Ponzi scheme though it may be.) Children of parents who give up the right to claim a child as a dependent so that the child could claim the American Opportunity education credit were denied this credit, again until I got involved. I battled the IRS over the disallowance of two of these, one involving over $1,250 in tax-a lot of money for a young man making $17,000. In both cases, IRS auditors, after a bit of research, realized their computer software had it wrong. This is yet another good reason to always run any IRS or state queries by us before acting, and doing so right away (which you are contractually bound to do anyway, per our "Statement of Responsibility"). Third, I've recently filed tax returns for multiple years for two clients after they received many love-letters from the IRS or state. In both cases, the IRS is failing to recognize the returns we filed (both going on six months with seemingly countless phone calls) and assessing tax on the basis of a single-filed return with zero deductions. Granted, the clients goofed (admittedly) by their failure to file returns for many years, but the refusal or incompetence on the part of the IRS in failing to accept the correctly-filed returns without having to make repeated phone calls to stop levies is beyond the pale. This is a position you and your loved ones never want to get yourselves into, so you may wish to pass this along to anyone you think may be behind in tax filings. Finally, it's becoming increasingly difficult to get penalties waived. The IRS can be very reasonable in abating many penalties, including late payment of payroll taxes when the taxpayer has a good history of paying or for first-time offenders. However, they rarely if ever waive penalties for "substantial underpayment of tax," which is 20% of the additional tax if more than $5,000 in additional tax is owed pursuant to an audit. What galls me is this applies even if there is additional withholding, so that if you forgot to include a W-2 for $24,000 and your tax increases by $6,000, even though $4,000 was withheld they'll still assess the substantial underpayment of tax penalty because the tax increased by more than $5,000. The other one that is becoming increasingly irritating is the penalty for late filing of an S corporation tax return, which didn't even exist until three years ago and is now $195 per month per shareholder for up to 12 months. That can really add up. The good news is most of our dealings with the IRS are courteous and fair. In the vast majority of cases, the resolution is in our favor. However, the errors on the part of the IRS-often resulting from an initial error or unnecessary procrastination on the part of the taxpayer, but not always-are more common and challenging to deal with than in past years. As noted in issues # 25 and # 40 of Wealth Creation Strategies, the myth-making surrounding Roth IRAs and Roth conversions likely exceeds those of any other tax-related issue, just as "marginal tax bracket" (discussed in issues # 28, 29 and 30 of WCS) probably is subject to a far greater degree of misunderstandings than any other tax-related topic. Such myths are prevalent not only in the mass media, but even in tax-specialty publications. Here are a few recently found in one publication that generally doesn't make errors, much less what might be considered egregious ones. "Most taxpayers drop into a lower tax bracket when they retire, thus offsetting some of the Roth IRA nontaxable benefits." Although a partial myth, it's a big one because it can easily mislead. While I've never seen statistics on the percentage of taxpayers who drop into lower brackets in retirement, any such statistics would likely themselves seriously mislead due to the pervasive omission from the analyses by others of the Social Security phase-in phantom (i.e., real) tax brackets and the effect on tax rates after the death of a spouse. These brackets subject many retirees in the advertised 15% bracket to a 22.5% and 27.75% phantom bracket on additional income earned in retirement and many in the advertised 25% bracket to 46.25% real tax rates. Because of the mind-set created by this myth, I suspect many taxpayers shy away from Roth IRAs and Roth conversions, which ends up costing them far more tax in retirement than they would have paid by taking greater advantage of Roth IRAs and conversions pre-retirement. "If the taxpayer is approaching retirement age, there may not be enough time to recoup the taxes from the Roth IRA conversion. According to the Wall Street Journal, it takes 15 to 20 years of tax-free growth to recover the taxes paid at the conversion." This is so wrong. First, if the taxpayer is in the 15% bracket pre-retirement and will likely end up in one of the higher phantom brackets post-retirement, no time is needed to recoup those taxes. Second, even if you're in the same bracket pre- and post-retirement, no time is needed to "recover" the taxes paid at conversion. Whether those remaining in the same brackets pay the tax now by converting to a Roth or later by taking IRS withdrawals, the end result in terms of accumulated savings if everything else is equal will be the same. Again, this merely discourages many taxpayers from doing Roth conversions who would be best advised to take advantage of this extraordinary tool. "The taxpayer will need a sum of cash-a large sum if converting a large traditional IRA-to pay the current tax bill." This depends on the person. I've got at least one client who's been slowly converting her IRA in $20,000 to $40,000 chunks for several years. Because her taxable income without the conversions was negative, she's been able to convert almost $200,000 at a cost of less than $15,000 in taxes. Sure, if she'd converted all of it in one year she'd have needed a large sum of cash to pay what might have been closer to $70,000 in tax. But then, she wouldn't have been our client. I do my best to live by the principles in which I believe. One of those is not expecting others to pay for my needs (sorry, but my needs do not create a right to the derivatives of your life-including money earned from voluntary interaction with others), which includes health insurance. Since I believe in economic incentives and the idea (have I said this before?) that little ordinary things should never be covered by insurance and even for relatively larger expenses we should all have some skin in the game (to disincline us from overusing scarce resources), my wife and I have a high-deductible insurance plan. This means, in most years (i.e., barring prostate cancer and the like), we pay for everything. Some of you might consider the following TMI ("Too Much Information"), so I understand if you choose to skip this piece. However, when I shared this story with my doctor, he strongly suggested I share it with others. So, here goes. It was time for my first colonoscopy (hey, I'm at that age). I'd been experiencing some digestive problems and acid-reflux (burning esophagus) and figured heck, as long as they're going in one way, why not the other. The doctor found what I suspected: an inflamed esophagus (though not as inflamed as many, she assured me). Because of prior stomach problems (largely but not completely cured by cutting out high-acid coffee and teas), I'd learned that as close as Prilosec and Nexium are to each other chemically, Nexium was the only drug that worked for me-naturally, the far more expensive drug not yet off patent. I'm one to tell the pharmacist, in shock when I spend several hundred dollars at a time paying for my hypertensive med (Atacand), "Thank God for the creative geniuses at the pharmaceutical companies. This drug has likely added a decade or two to my life. I offer these much-maligned companies, scientists, executives and other employees behind them my gratitude, for which I'm more than willing to pay." However, that doesn't mean I'm not on the look-out to save money and cut out or down a drug where I can. While I tried-and couldn't-come up with an alternative to Atacand (although I found I'm able to drop the dosage by 25-50% by adding 6,000 International Units of Vitamin D daily, which is far cheaper) and Celebrex (I seem to have inherited by mother's tendency to arthritis, but would far rather have the freedom of choice to purchase Bextra, which the nanny-state now denies), I wondered if I could find some natural cure to the acid-reflux problem and cut down or even eliminate Nexium. After some Internet sleuthing and getting past the brilliant marketing genius who sells a 48-page report on the subject for $39.97 (not that I mind paying for information, but I began to get irritated when I realized Googling "acid reflux remedies" gets you virtually nothing but his report under an enormous variety of different domain names), I finally found what I was really looking for: sufferers sharing their own stories and remedies (I changed the Google search parameter to "acid reflux home remedies"-wow what a difference one word can make in a search engine). I'll share what works for me: aloe vera juice, apple cider vinegar, apples, pickles, ginger, mustard and digestive aids. I take a daily swallow of Aloe Juice (Lily of the Desert: stomach formula) by itself and a tablespoon of (Bragg's) organic unfiltered apple cider vinegar, mixed with water and usually a few other morning additives to mask the flavor (both are available from health food stores and Whole Paycheck Market). I average a pickle or two a day (I've discovered the amazing difference in tastes among pickles-I don't care for Vlasik, but other brands, mostly bought at Costco, are to my liking) and, usually, some pickle relish on something and a few pieces of crystallized candied ginger (TJs). When I occasionally feel that burning feeling coming on I quickly take a teaspoon or more of mustard (it doesn't seem to matter what kind). At first I ate quite a few apples, but I'm not a big fan and I'm controlling the disorder without. I take a couple of digestive aids before, during or after every meal. It seems our ability to produce essential digestive enzymes on our own can diminish with maturity. When I first looked at digestive enzymes, I realized the formulas were so different among manufacturers I should try several. Off to Whole Foods I went. Two different employees assisted, both likely in their 20s, both admitting they too had serious acid reflux issues. I was shocked at having such a problem at their age, but figured out later the problem might be lack of hot dogs. They work at Whole Foods, so they probably don't eat them. What comes with hot dogs? Mustard and pickle relish! Hey, just a thought. A guy about my age overheard my queries and said, "Digest gold." I said, "Say what?" and he responded again, "Digest gold." He explained Enzymedica's "Digest Gold" is for him by far the best digestive enzyme available (and happens to be the most expensive I've found). Turns out it didn't seem to do a thing for me. Everyone needs to experiment with different brands and formulas and find the ones that work for you. I decreased my use of Nexium over a few month period and have gone without for the last two or so months. It's likely healthier for me anyway, since I believe the drugs treat only the symptoms and it seems I've treated the underlying problem. I'm not sure I'd have been inspired to do the research and try the various additives to my diet if I didn't have that added incentive of having to pay for relatively trivial items out of my own pocket. If everyone had to do this, think of the overall savings in the medical system. And then you'd have more money to spend on other things-including higher levels of medical care, which is good if it's your own money and your own decision.